For the complete SPIDER-MAN WEEK 2017 Index of features, click here! 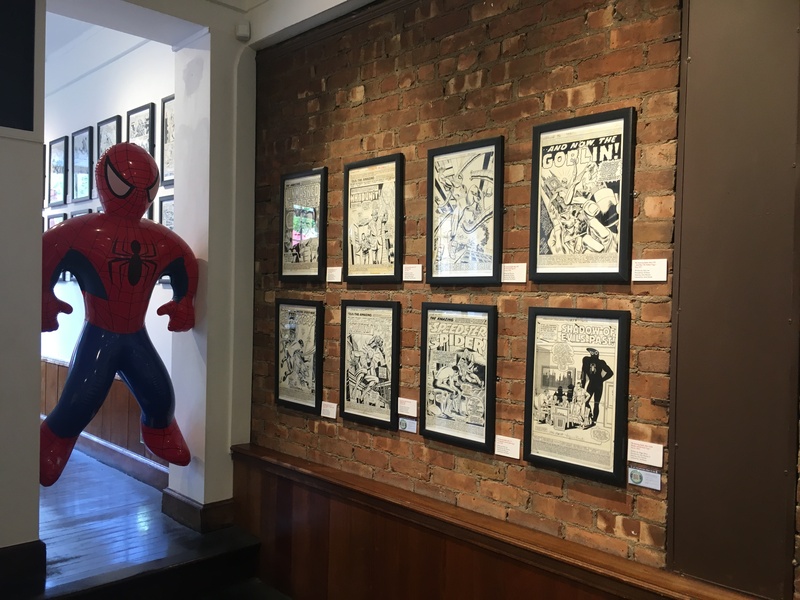 If you live in the New York area or are planning to visit this summer, then you absolutely must visit the Society of Illustrators on the Upper East Side for the greatest exhibit of original Spider-Man art you’re ever likely to see. That’s not hyperbole, either. 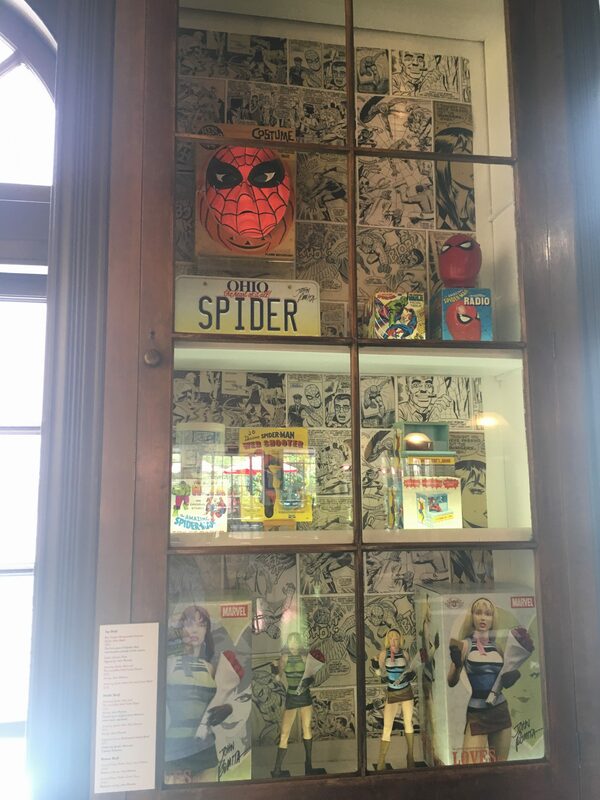 The Society has dedicated two floors to the collection of Mike “Romitaman” Burkey, an art collector and dealer with an extraordinary collection of original Spidey art. 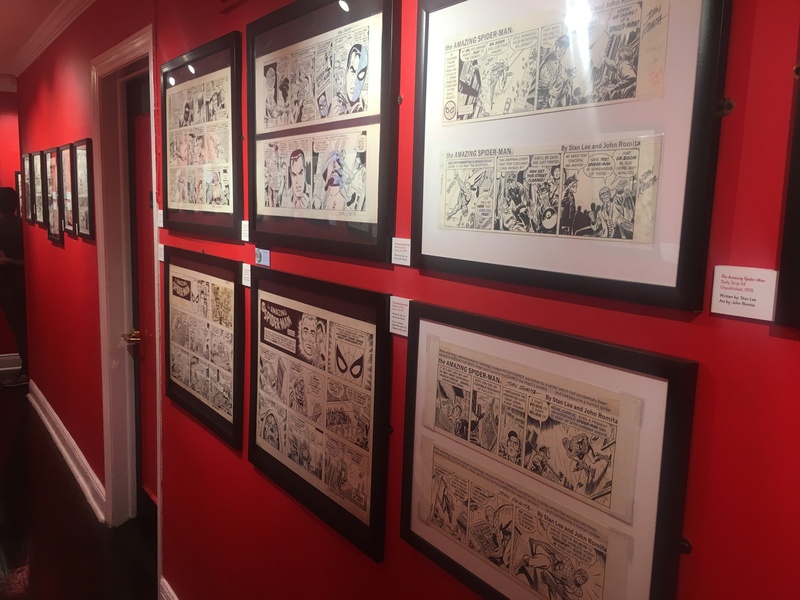 The headliner is John Romita, but four of Steve Ditko’s most famous pages are on display, as well. Spideys stand sentry at the Society, at 63rd and Lex. But that’s not all. Here are some of the other names whose work is being shown until Aug. 26: Gil Kane, Todd McFarlane, Ross Andru, Ron Frenz, Keith Pollard, John Buscema, Keith Pollard and John Romita Jr.
He’s not kidding. 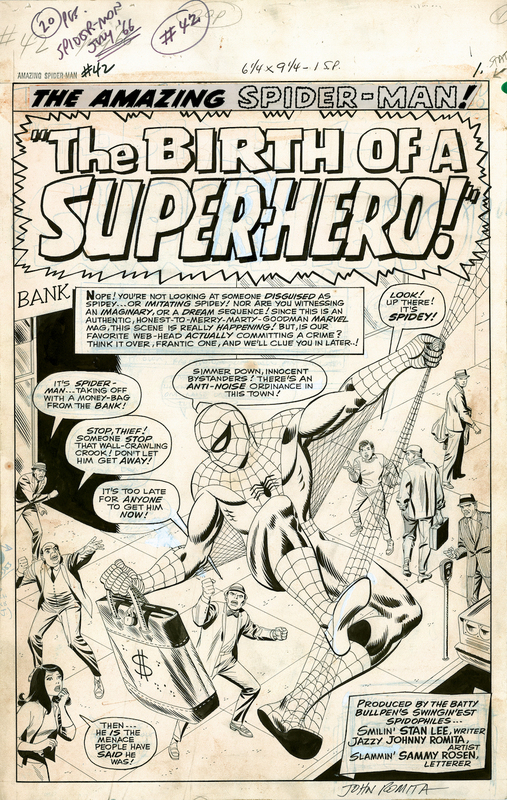 Ditko’s Page 4 from The Amazing Spider-Man #33 — which is on display at the Society — has been appraised at half a million bucks, according to Pistella and Burkey. And Anelle Miller, the Society’s executive director, told me that Burkey has enough in his collection to do several more of these exhibits. You can find out tons more, including ticket info and pricing, by checking out the Society’s website here. And when you visit — the address is 128 E. 63rd St. in Manhattan — make sure you pick up a copy of the exhibit’s groovy program, which includes tons of high-res scans from the show for a mere $20. Dan Greenfield: Tell me how you started collecting comic art. Mike Burkey: I actually got into the original comic-book art hobby by accident in the sense that I was collecting comic books while I was in the Army at West Point. The day I got out of the Army I saw an ad in the famous Comics Buyer’s Guide weekly magazine for original comic art. I had no idea what it was, really, but part of me felt that something drawn that is one of a kind, used to create the actual comic book, will probably be worth more than comic books in the future. 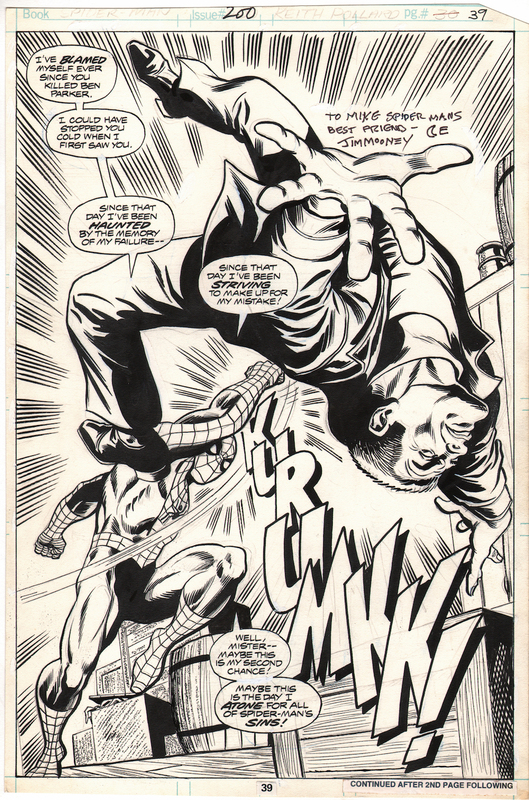 So I bought my first piece of artwork, which was actually a battle page of Amazing Spider-Man #46 where Spider-Man battles the Shocker. (This page is actually displayed at the museum.) That day when I opened up the package and saw exactly what the page looked like, a light bulb went off in my head and I told myself that this was going to be very valuable one day. Stan Lee’s pencil handwriting outside the margins of the artwork telling John Romita how to draw the story made it even more amazing to me! Dan: How did this exhibit come together? Mike: The exhibit came together when I was talking with my good friend Rob Pistella about how this great Spider-man artwork should be in a museum to be seen by everyone. Rob was the main man who worked with the Society of Illustrators to get us all together to get this set up. And we all feel it worked out extremely well. Dan: How were you able to accumulate all these great pages? Mike: The funny part about all this is, I was able to accumulate so much because since John Romita was the second man to draw The Amazing Spider-Man, no one wanted to collect his artwork. Everybody wanted Steve Ditko artwork. He was the man who drew Spider-Man #1 through #38. 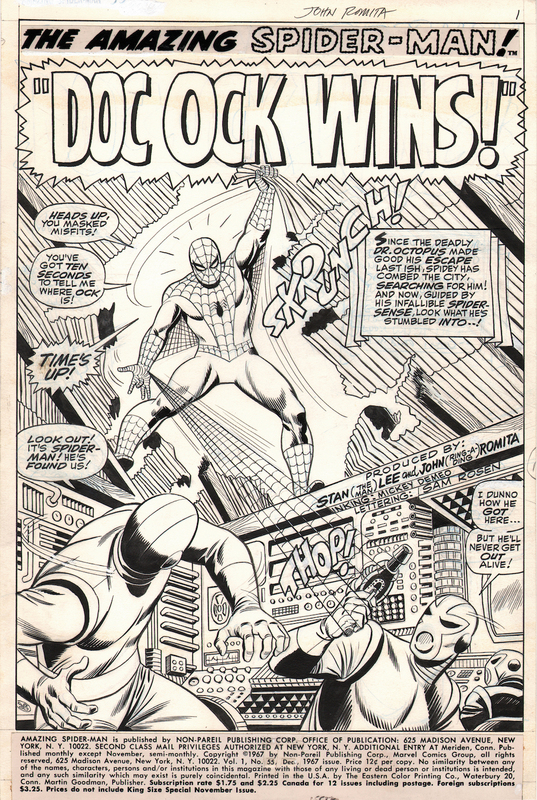 John Romita Spider-Man artwork was basically an afterthought in the hobby. I just loved the character so I didn’t really care who drew it. 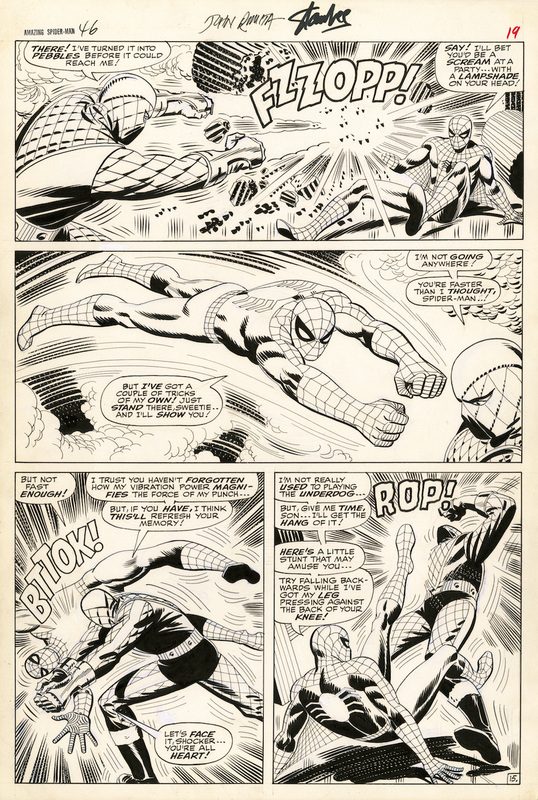 Since Steve Ditko Spider-Man pages were selling for $1,000 each in 1990 and John Romita Spider-Man pages were selling for $40 a page and no one collected them, I said to myself, “For $1,000 I could get one Ditko Spider-Man page that everyone is collecting, or I can get 25 John Romita Spider-Man pages that nobody is collecting!” And that’s how it started. I also put ads in the Comics Buyer’s Guide searching for Amazing Spider-Man pages by John Romita. I met many people and I was able to buy a lot of art there. I always tried to stay ahead of the curve from the very beginning. 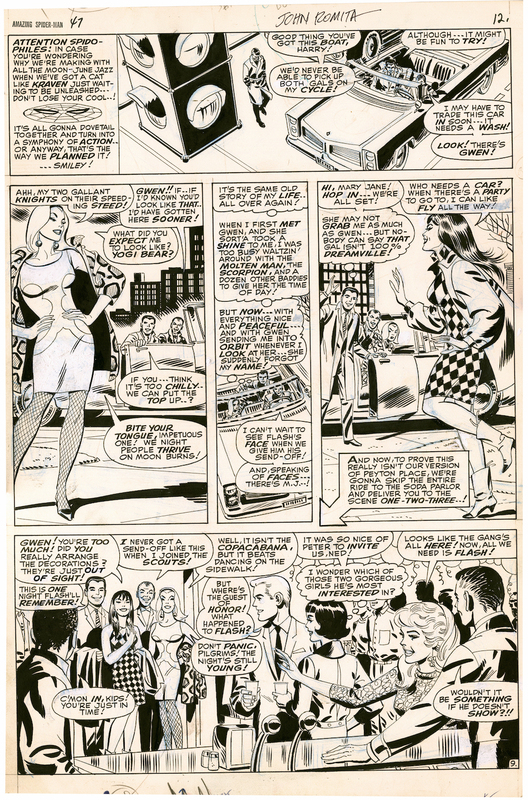 When John Romita pages were selling for $200 I was paying $300. When they were selling for $300, I was paying $500. When they were selling for $500 I was paying $700 and so on. 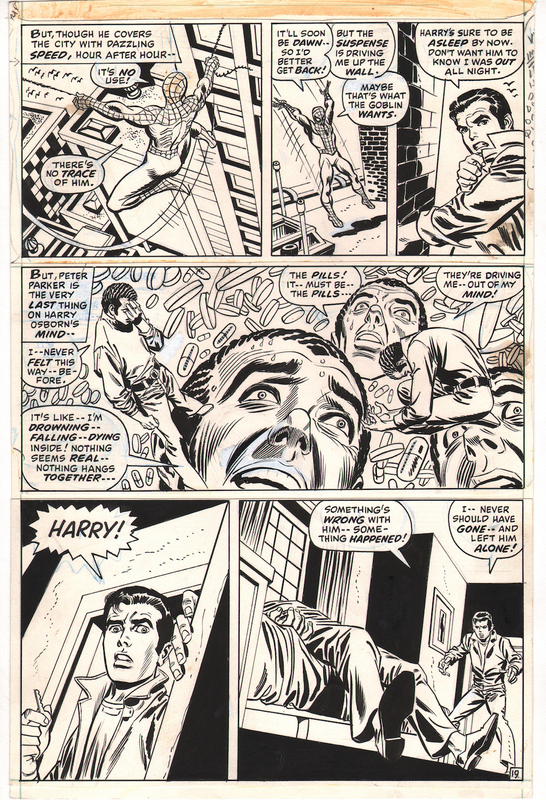 I bought a lot of John Romita comic-book art and original newspaper-strip art directly from his art agent, from 1990 until 1996, when unbeknownst to John Romita, his art agent said I had too much and he stopped selling art to me. I decided then to become my own comic-art dealer. I realized early on that collectors “collect” so I also had to have “trade art” I didn’t collect. I could offer non-Spider-Man art to those collectors who had what I wanted, but didn’t want to sell. So I actually started buying and selling and trading non-Spider-Man artwork to help me get more Amazing Spider-Man artwork I did collect. The trades and funds I had helped pay for the Spider-Man art I wanted for my collection back then, which I pretty much still have to this day. Dan: I take it John Romita is your favorite Spidey artist? 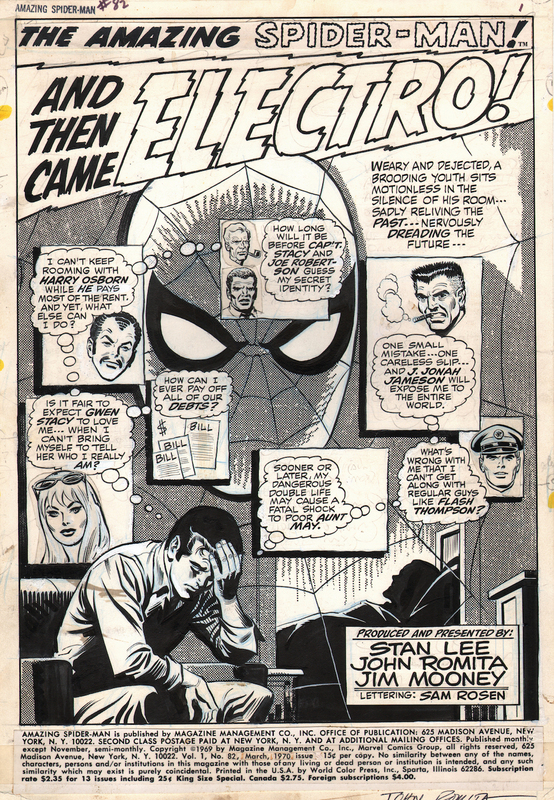 Mike: Yes, John Romita is my all-time favorite artist! Not only is he one of the greatest comic book artists of all time, but he is one of the nicest men you’ll ever meet in your life. He is so humble when he talks about his work at Marvel Comics, and he does not even realize to this day how loved and cherished he is for all he has done for those of us who read and looked at the beautiful artwork, and read his and Stan Lee’s great stories! Dan: Which of the pages are your favorites — and why? 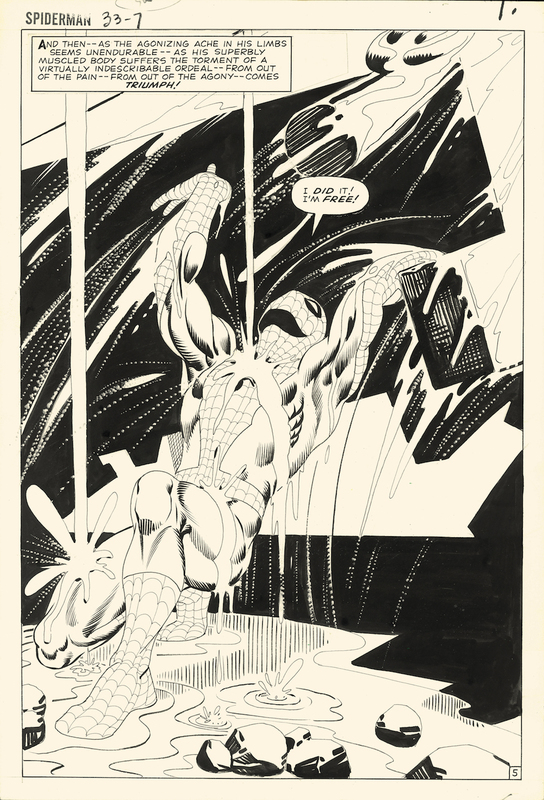 Mike: I have a lot but my favorites are always what we call the “twice-up” Spider-Man art pages. This is the larger-size artwork that artists drew back then through the latter half of 1967. These are 12″ x 18″ art images drawn on roughly 14″ x 22″ art board. 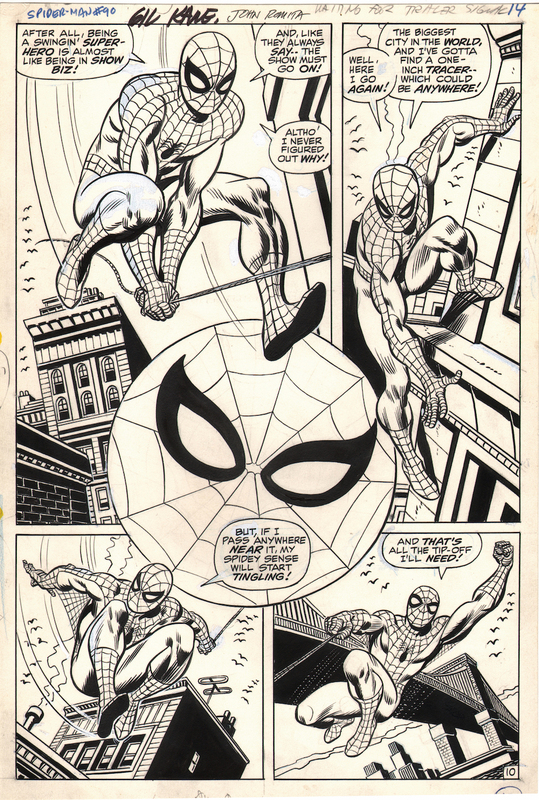 The last twice-up Amazing Spider-Man pages were in Issue #53, so Amazing Spider-Man #39 thru #53 are my favorites. 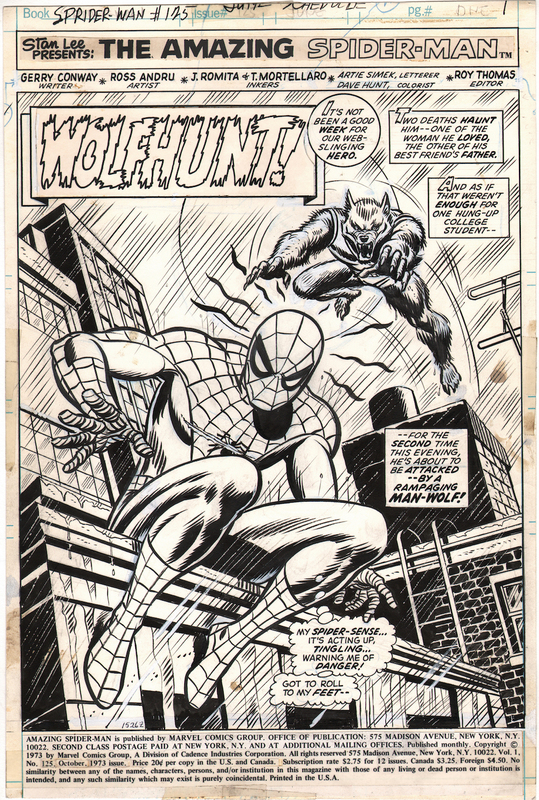 But there is one story not by John Romita that I actually consider my all-time favorite story and that is the story from Amazing Spider-Man #248 drawn by Ron Frenz and Terry Austin, and written by the great Roger Stern. It’s aptly titled The Kid Who Collects Spider-Man, from Issue #248. You have to read it. 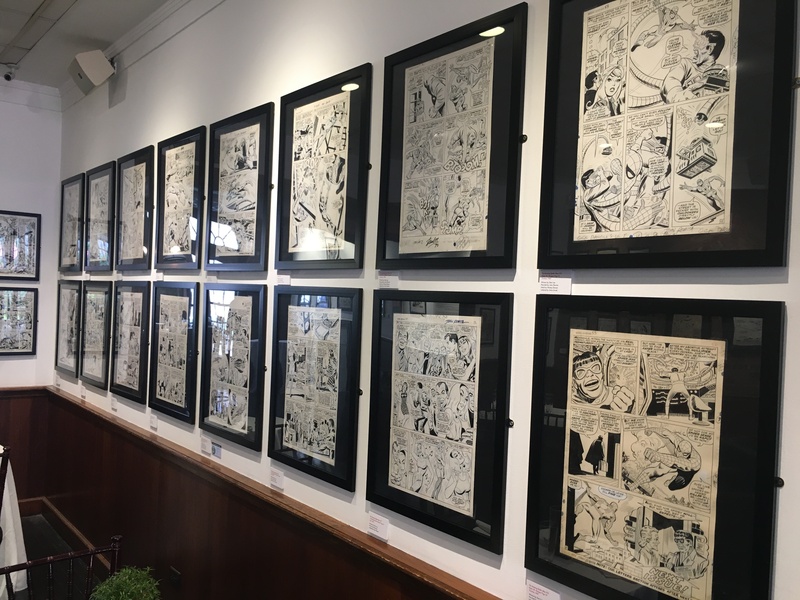 I have seven of the 11 original pages to the story displayed at the museum with the writer’s typed-up pages for the entire story, as well as the 11 prelim pencil pages for the entire story with it (by Ron Frenz). It’s a great, great read and I highly recommend it but I don’t want to tell you the story here and spoil it for you! I consider that the greatest Amazing Spider-Man story of all time, with Issue #33 by Steve Ditko being a close second. 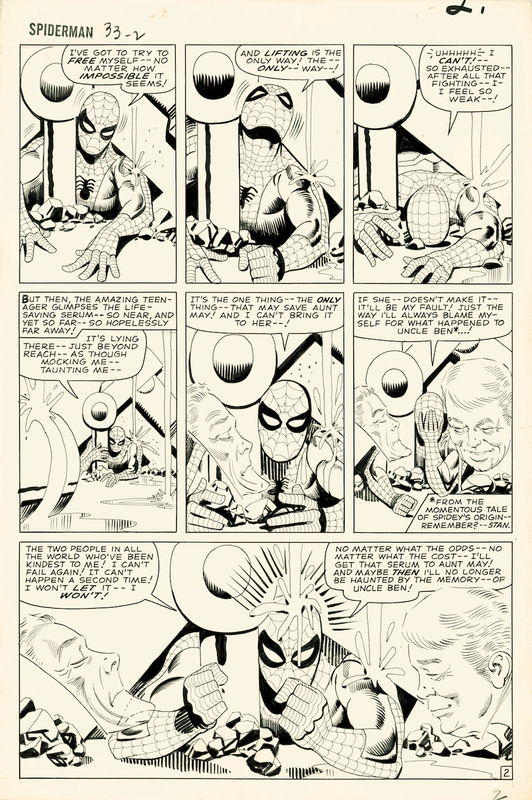 Ditko’s ASM #33 — perhaps the most iconic Spidey page of all time. Dan: Which page has the best story behind it — as in, what it took for you to get your hands on it? Mike: Boy there are so many crazy stories on how certain art pieces were ultimately acquired. The Amazing Spider-Man #98 was always one of my favorite stories. 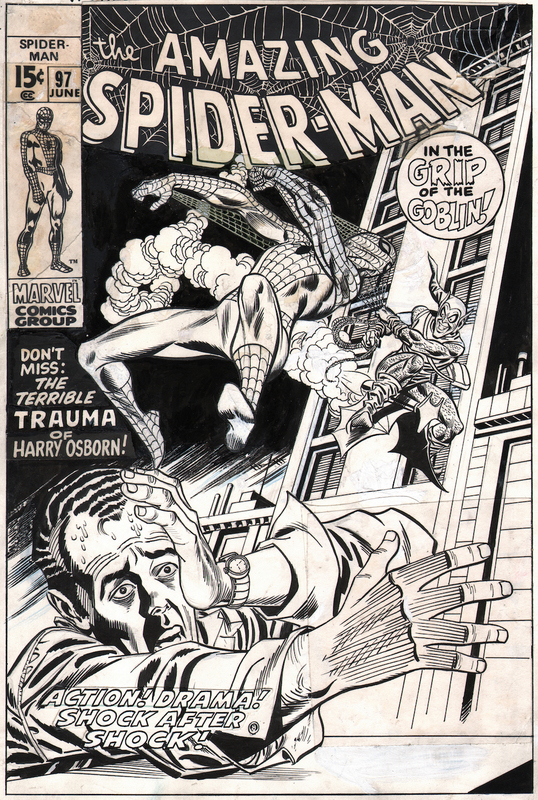 It’s a classic Gil Kane “drug issue” with Spider-Man battling the Green Goblin, with Harry Osborn taking drugs. Marvel did these three drug stories in Issues #96-98 to promote drug awareness. I owned 19 of the 20 pages to Issue #98. I’d acquired pages randomly throughout the years, and I was one page short of completing the entire story. Right around the year 2000 I set up at a Chicago convention selling comic art, and out of the blue a friend of mine in the comic-art hobby walks over with a guy with a piece of art. My friend says, “This is the guy you want to sell your page to” and he was referring to me. Unbelievably, the local guy in Chicago had the last page I needed to complete the story — which was actually the best battle page in the whole story. When I looked at it, I started getting weak knees when I realized it was the last page I needed to complete the book. The guy said he collects early Spider-Man comic books and I had, oddly enough, earlier in the show, traded some art I had for six early Amazing Spider-Man comic books, which I rarely do. They really meant nothing to me personally and he said he would love those six books and a couple hundred bucks cash, so we did the deal and I completed the story to Amazing Spider-Man #98! Dan: What’s your Holy Grail? The one page you’ve always wanted but haven’t been able to land? Mike: Well, right now I would probably say there are two pieces that I would love to own that I’ve never seen yet after collecting comic art for 28 years. 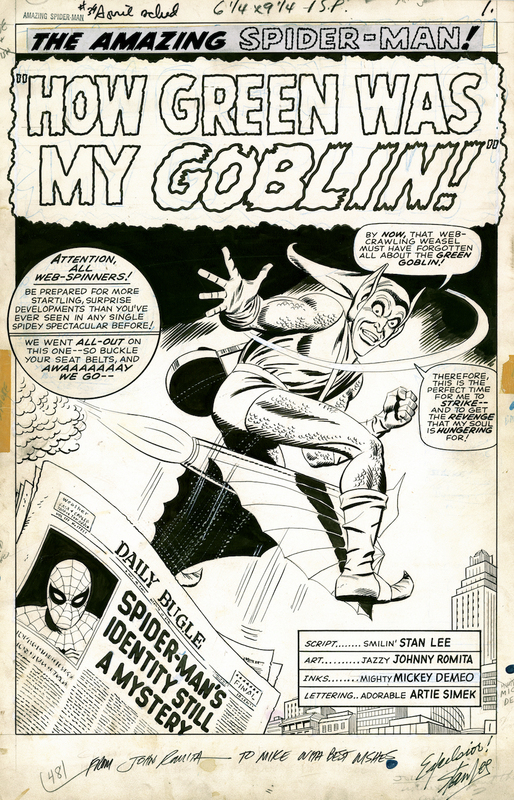 They are the cover to Amazing Spider-Man #39, which is John Romita’s first Spider-Man cover, with the Green Goblin on it. And the other is the Page 1 splash page to Amazing Spider-Man #41, with Spider-Man and the Rhino squaring off in a big spider web! That’s always been a personal favorite of mine. Dan: Besides Spidey, what other gems are in your collection? Mike: I am a big Incredible Hulk fan also and I probably have the biggest Incredible Hulk original cover-art collection in the world. I’ve always loved Spider-Man and the Hulk — Spider-Man being the sad sack kid under the mask that nothing ever goes right for him, and the Hulk, a creature who everyone thinks is a monster when all he wants to do is to live and be left alone. Yet both of these heroes, even when luck doesn’t go their way, even when they both get beat on, they both still, always do the right thing. As a kid, I always loved the Hulk covers so in the early 2000s, I started collecting Hulk covers to go with my Spider-Man collection. I have over 50 Incredible Hulk covers and six or seven complete Herb Trimpe original Hulk stories. I also collect Spider-Man toys and memorabilia from the 1960s to the 1990s. I have 2000-plus Spider-Man toys and memorabilia pieces. My favorites are the three director’s chairs signed by Tobey Maguire, Kirsten Dunst and director Sam Raimi for the first Spider-Man movie back in 2002! Just a few pieces of Mike’s memorabilia collection. On display at the SOI. Seen enough? Of course not. Here are some more pages! 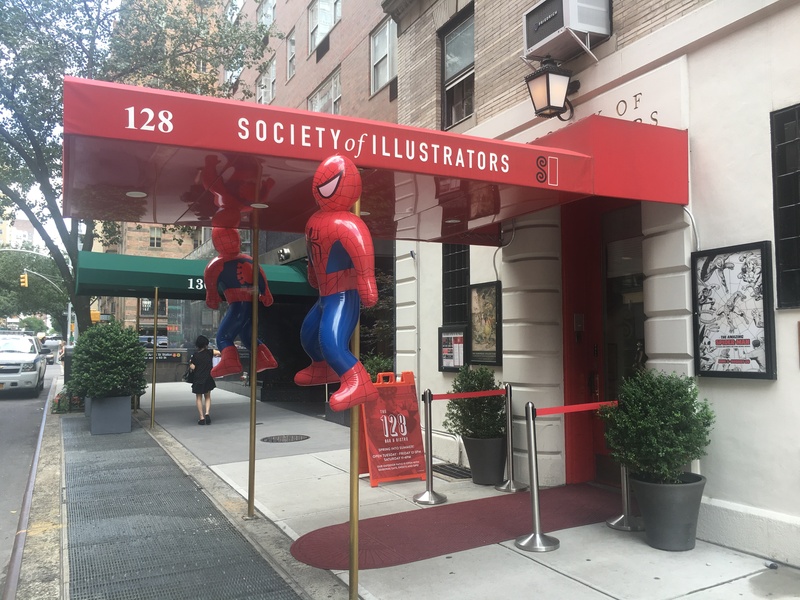 For more info on the Spidey exhibit and the Society of Illustrators, click here! Great stuff! appreciate seeing it!